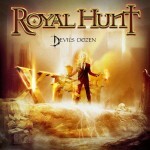 Share the post "Album review: ROYAL HUNT – XIII : Devil’s Dozen"
Danish progressive metal kings Royal Hunt return with “Devil’s Dozen” which is, surprise surprise, their 13th studio album. The man behind Royal Hunt and its music always has been (and always will be) keyboard maestro Andre Andersen who formed the band back in 1989 and is the only member to survive the many line-up changes over the years. Vocalists have come and gone starting with Henrik Brockmann and followed by DC Cooper, John West and Mark Boals. DC Cooper returned and has now been back on board since their 2011 album “Show Me How to Live”. Opener So Right So Wrong starts with an orchestra warming up before a Middle Eastern feel introduction leads into what can only be described as an epic. DC Cooper tries a different vocal style for the verses which takes a while to get used to though. May You Never (Walk Alone) continues in a similar vein building from its quiet piano only opening. Heart On A Platter features an effective tribal like opening. Until The Day can be classed as the token ballad…but it is a powerful one. That was one of my concerns with their last album “A Life To Die For”…it dragged a little in places due to the slower ballad-like numbers. Rags To Riches again features a memorable opening with pounding drums and a medieval flute before the kitchen sink kicks in. Closer How Do You Know is the shortest track Royal Hunt have released in a while but it is one of their most catchy numbers. Great way to finish. Andre Andersen’s song writing, orchestration and keyboard playing really stand out on “Devil’s Dozen” and together with a modern crystal clear sounding production make for a thoroughly enjoyable listen. This entry was posted in ALBUM REVIEWS, ALBUM REVIEWS (Mobile), All Posts and tagged album, Andre Andersen, Andreas Habo Johansson, Andreas Passmark, DC Cooper, Devil’s Dozen, Frontiers, Jonas Larsen, progressive metal, review, Royal Hunt, XIII, XIII : Devil’s Dozen. Bookmark the permalink.